Plastics are polluting the globe via waterways to the oceans & food supplies. Unlike wood their manufacture creates large carbon emissions. Even polymers are choking landfills & don't retain carbon for slow release. 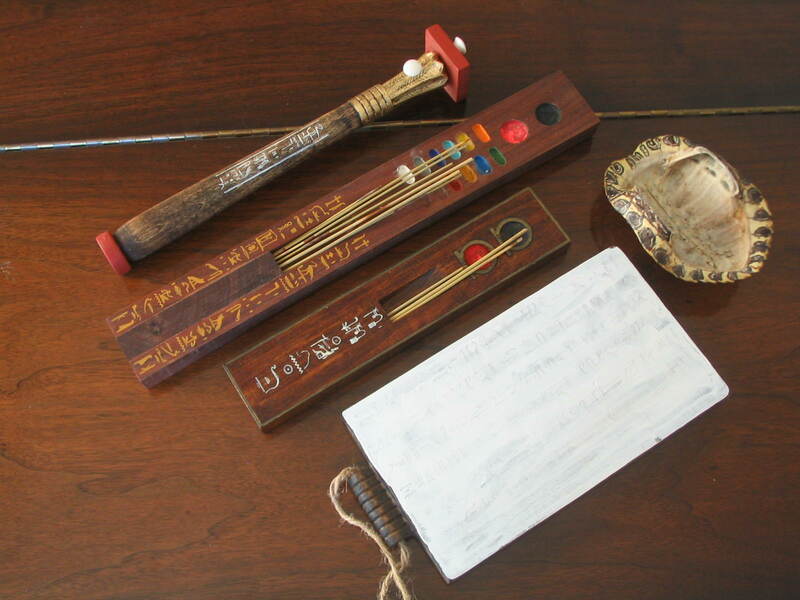 After many years creating spiritual objects it became apparent that authentic items, necessary to kemetic spirituality, were virtually non-existent. Statues, shrines, devotional instruments & art have been mass-produced, generic lumps of thoughtless plastic & resin without any regard given to correct form, materials or workmanship. My creations are not fakes or facsimile. THEY ARE ORIGINALS made from traditional geo-friendly sustainable & recyclable materials. 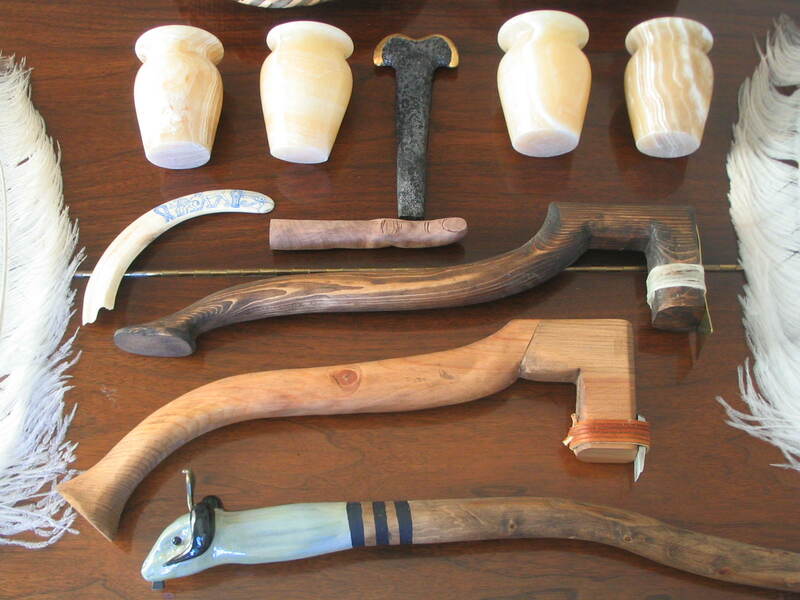 I am providing the same services as the ancient craftsmen. 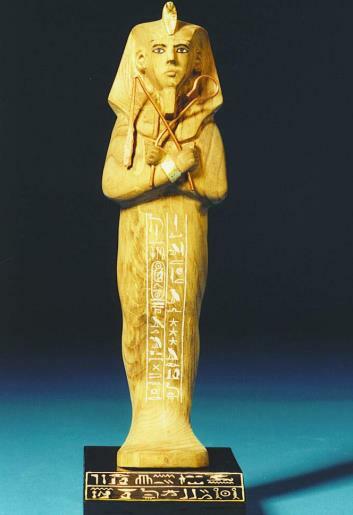 I believe all proper objects should be able to get a positive nod from any Egyptologist. 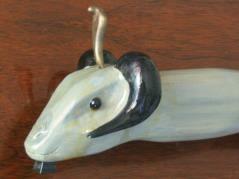 The discerning buyer should not be limited to pre-manufactered toxic trinkets. Such ritual/devotional objects should look, feel & BE authentic in every detail, created BY HAND, not by a non-thinking machine from polymers & plastics. All my items are also properly consecrated. So help the earth & buy authentic materials & properly recycle. The future is in your hands. 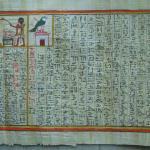 I will produce any text & transcribe it into correct hieratic on papyrus. I use all correct purification techniques as have been copied in the Judaic traditions. 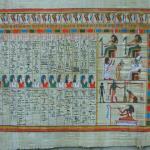 Amduat, Book of the Dead spells or classic pieces with B&W or color vignettes as is appropriate at $95. / foot (add $40. 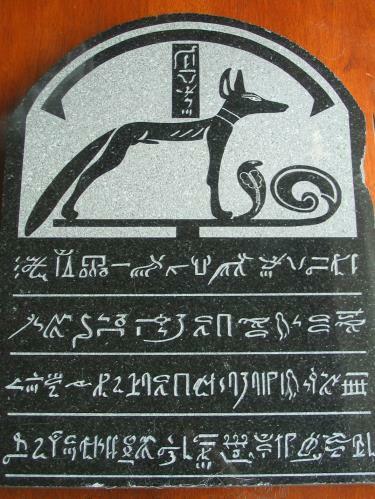 / foot for cursive hieroglyphs) + S & H. These are all handmade using real carbon-black ink. If you are not completely satisfied for any reason, please return the item & I will provide a refund, less postage, within 15-days. These are made for your faith or collection. They are superior to any pre-made printed or screened object, otherwise I wouldn't be making them. Same goes for any wood, stone or metal item as well. 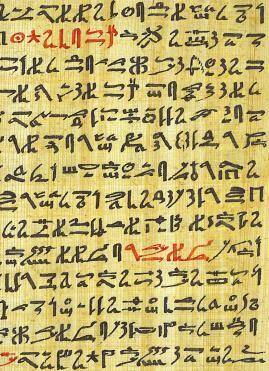 Example of cursive hieroglyphs... much more time consuming, but beautiful & befitting for the most ceremonious of uses. Simple cords with hook clasps come standard. Authentic beads in correct materials & shapes are important. Some I currently have include turquoise from Serabit el-Khadim, lapis, garnet, carnelian, serpentine, agate, bone, wood & gold-plated or polished brass spacers, glass & seed beads. The photos here are but a sampling of the possibilities. Since these are custom made for your amulet, & I obsess in obtaining the best materials, prices are on a "quote only" basis. Many styles available pleasing to all deities. I'll send photos for you to decide what's best for you. $20-30 is typical for most 18" or smaller. 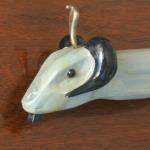 Amulets are the easiest way to honor & protect. 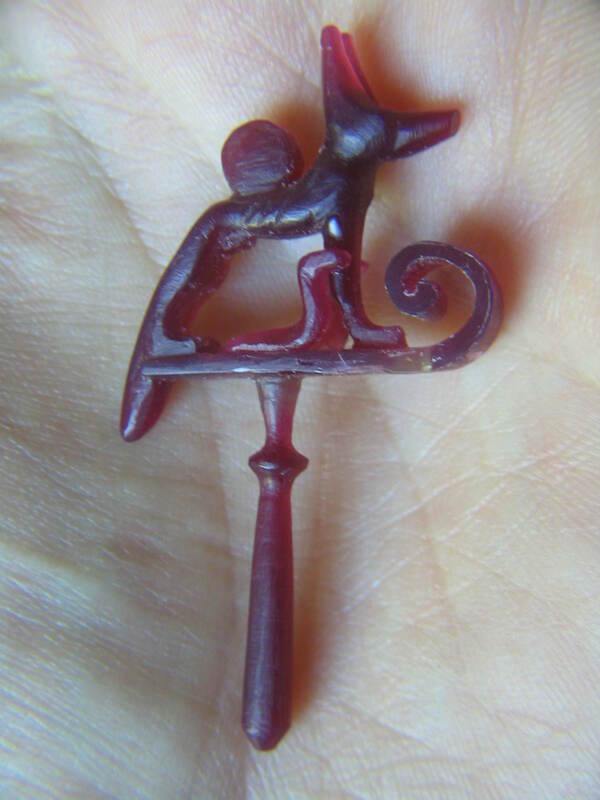 Apotropaic or pious, I cast metals by hand using lost wax originals. Copper, bronze & ceramic are authentic materials but I will cast in pewter & chase in brass affordably. The point is they're all made & finished by hand. 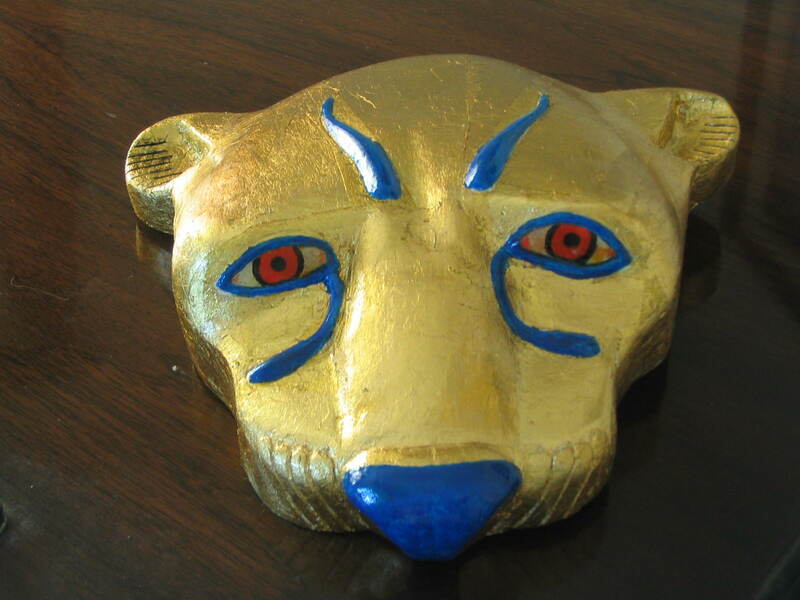 I'll custom make anything in metal or ceramic for your kemetic arsenal with the greatest attention to detail. These are cast, cut, carved & chased by me... they are original. Granite is the most perfect stone for devotional stelae. Limestone is much softer & pourous but is still an appropriate material. 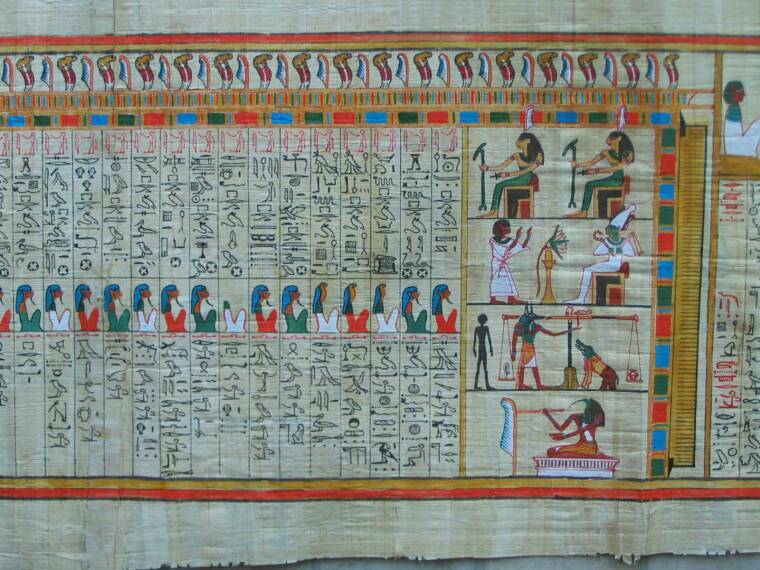 Stelas are etched in hieratic with an actual hymn & scene of the diety of your choice. 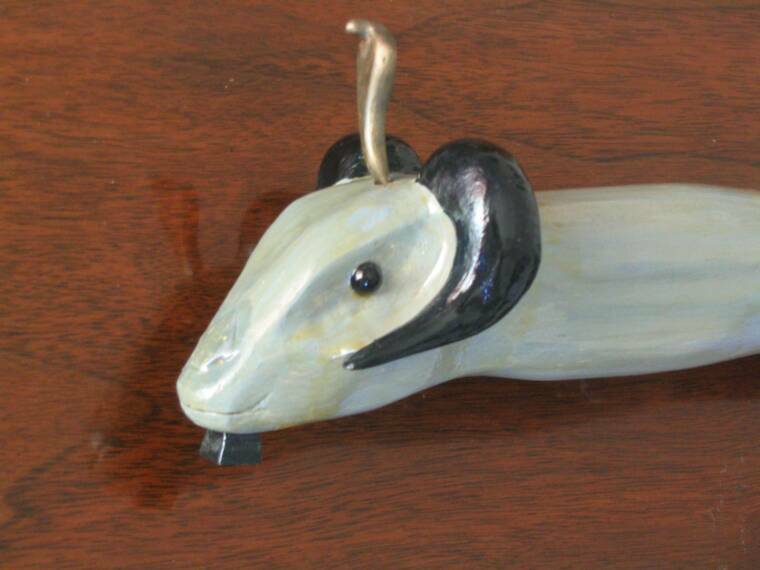 These are the most personal of devotional objects. If you're having difficulty deciding on texts & scenes I will assist you through the stone cutting process. It's necessary. Once it's written in stone... well, you may know the saying. Even our ancestors made mistakes. 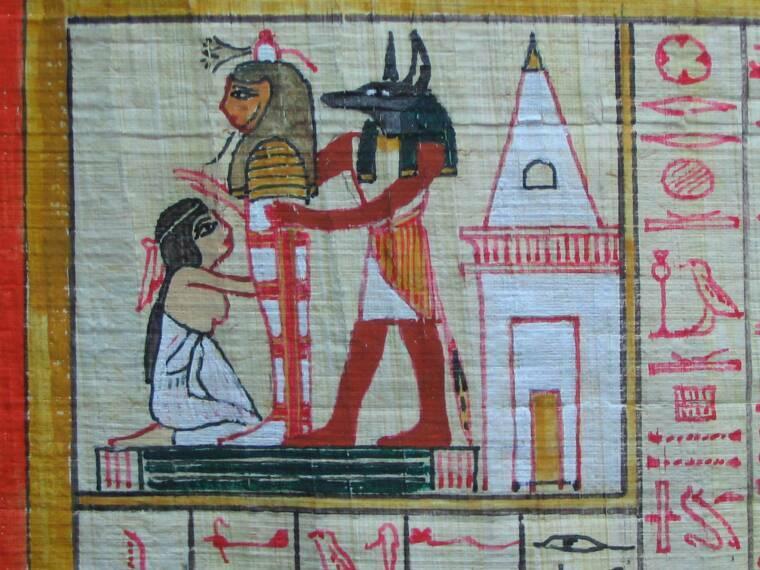 "Hail to you Wepwawet, Bull of sacred offerings, Lord of provisions; Great of the Ur-uret crown who came forth from the womb of his mother Nut to receive the white crown. 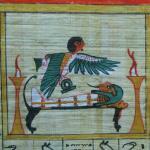 Eldest god who came forth (already born) wise & Geb commanded his heritance. Great god, Lord of Re-setau, grant to those a place by you and the souls of the nobles who are behind you." CUSTOM STATUES I'll custom carve any statue any size. Whether wood or stone everything is hand cut & the most pleasing for the spirit of god to recognize & inhabit. Wood is less expensive & quickly formed. Stone is the ultimate material meant for eternal recognition. 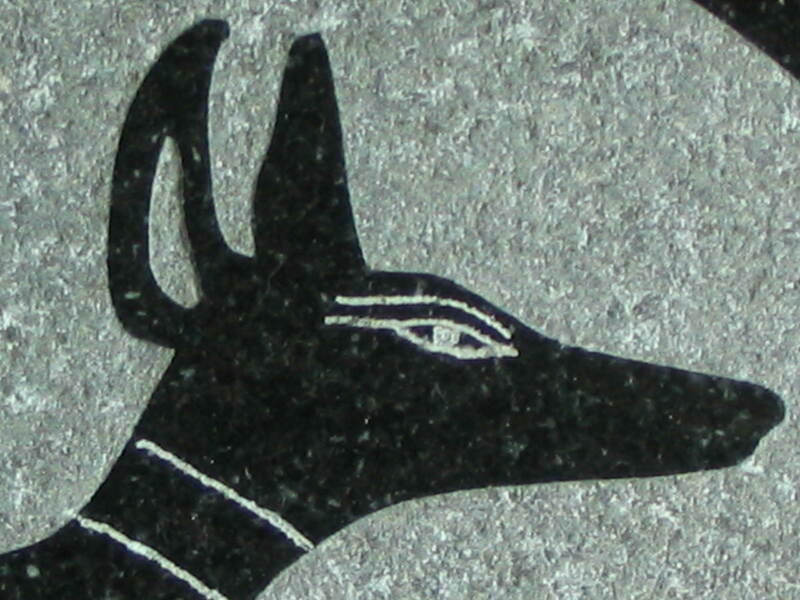 (that are in you) as Osiris, forever. Click on her for more photos. Asking $1,000. + S & H, O.B.O. Dieties don't belong in a car trunk or travel case. House them properly in a REAL shrine. Made from mutiple woods with pinned doors. 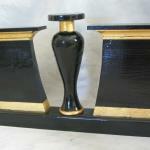 Can be black, stained, carved, gilded or ornamented per your specifications. This example is 20" x 15" x 10" (50x37x25cm) & is up for $250. + S & H (shrine only). Custom sizes are encouraged for your deity. Write me. 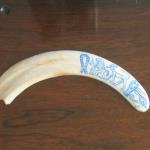 CUSTOM CEREMONIAL ITEMS FOR "OPENING THE MOUTH"
Cut in Egypt, finished by me - $30. ea. or set of 4 for $100. Without gilding or textured finish - $25. Single or two-piece with blade - $75. 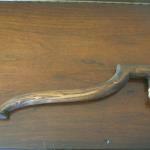 Carved cedar & pewter uraus - $170. Due to the hand crafted nature of my work, any of these items may take longer than 4-6 weeks to make depending upon demand, complexity & available materials. If a delay exists, or is pending, I'll let you know upfront. There are always variations in materials so what you get will be unique... just like any original. Yours will be equal or better than shown. God is in the details... and materials. Ancient scribes had many styles of palates. 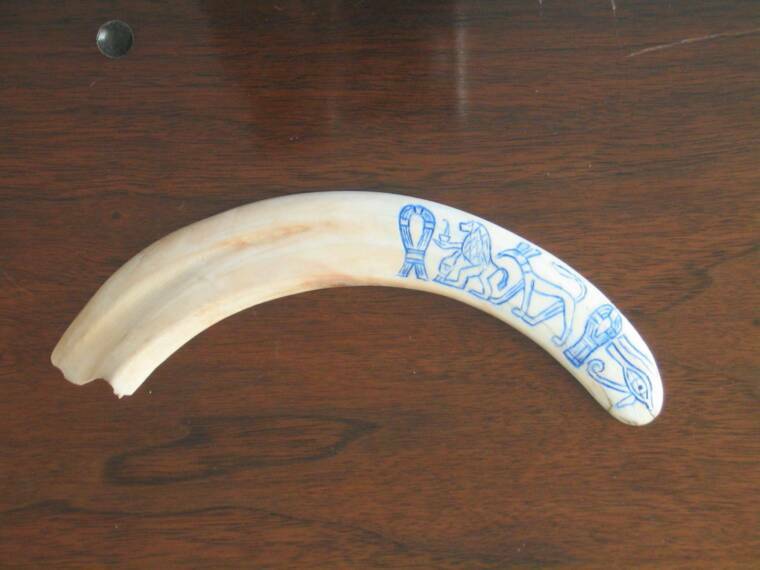 They were used in writing & marking objects ritually. Custom palates from natural walnut are the finest available. All have pen slot & ink depressions. Typical 10" x 2.5" x .75" (25x6x2cm) with some pre-cut tipped reeds. 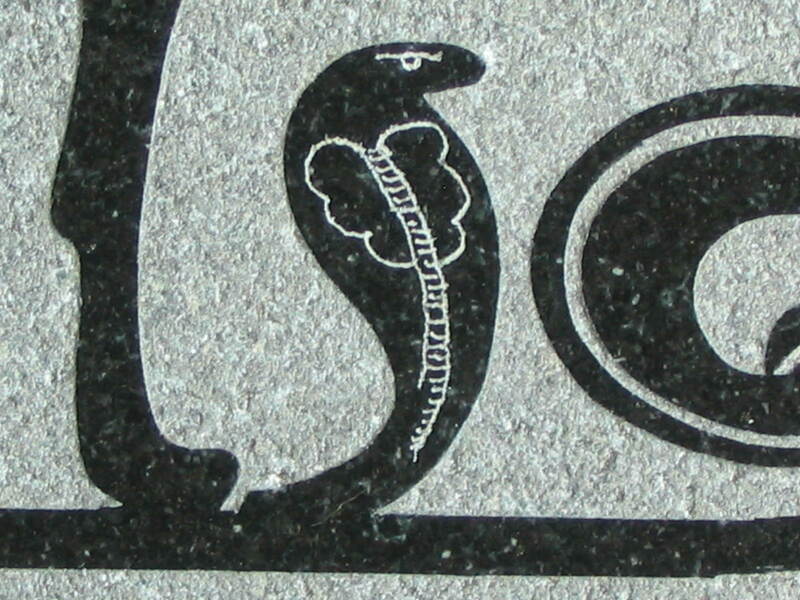 All are dedicated to Thoth on the reverse: $90. + S & H, $5. more for embellished "shen" wells, ocher or white, or shellac finish. These are personalized with any inscription of devotion you desire. A. Standard palate, embellished & inscribed with shellac finish $95. B. 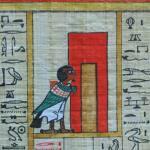 Artist's palate for specialists who embellished papyrus with vignettes & color $110. D. Writing board 5.5" x 10" with gesso face to wash off & reuse. Stained poplar $40. 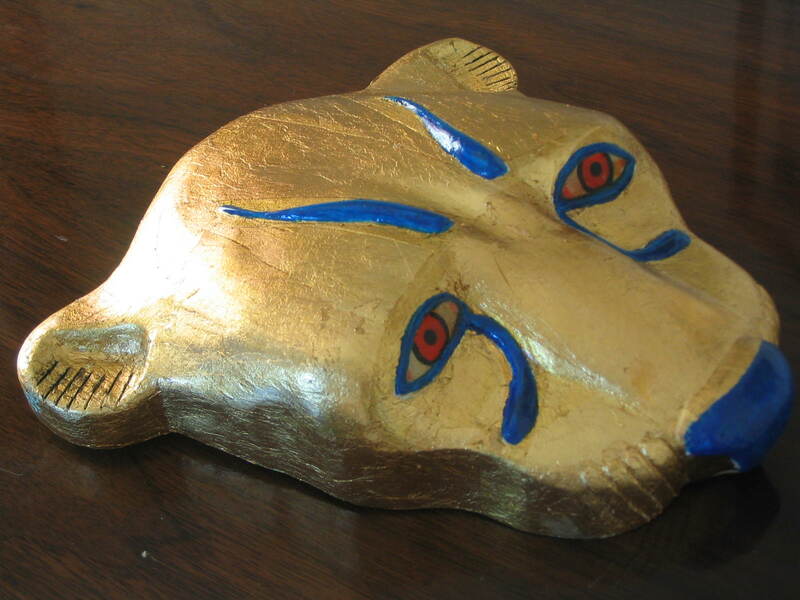 Carved from a single piece of spruce (tamarisk family), gilt over gesso with enamled inlays & back-painted eyes behind domed acrylic, layered painstakingly by hand over a period of days: $275. + S & H Can customize further with names or inscriptions. Flat reverse is stained or gilt. 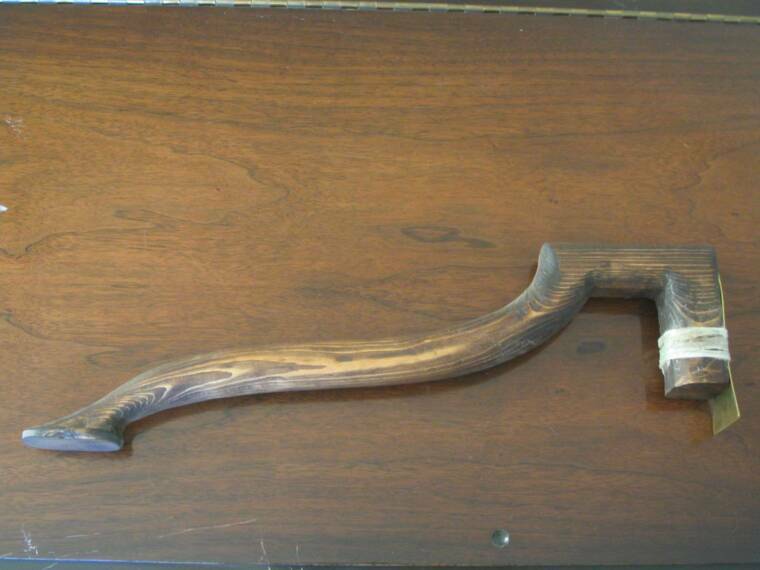 Handmade & hand-carved from the finest hardwoods. These are real working examples with correct 7-palms & 28-fingers being 52.3cm long... 1/440th the base dimension of the Great Pyramid of Giza $180. 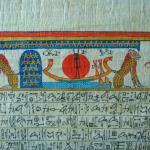 + S & H .
CLEARANCE: Scroll: Eight chapters from the Ani papyrus Coming Forth by Day on a 14' (4m) long extra heavy papyrus. Chapters: 72 rubric, 89, 91, 175, 125, 23, 78 & 69. A labor of love that was months in the making. Has blank spaces throughout each chapter for the name of the deceased. A masterpiece that belongs in a museum, or in a house of eternity. I have spent a lifetime studying the spititual customs of the ancients, creating items as a continuation of the spirit that inspired them thousands of years ago. It is with great joy I offer my services to others of like mind. Please view the following knowing they were crafted by pious hands. Enjoy your visit. Please sign the guest book below! While the arrangement of this page may not be the best, it is my intent to expand & simplify things if interest & positive comments create a sustainable demand. Thank you for looking. I welcome your thoughts. Praise & adoration to you Wepwawet. 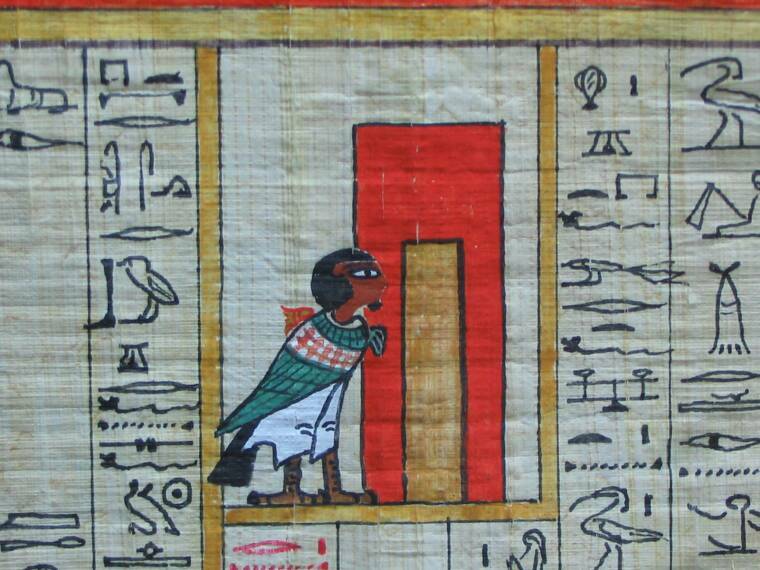 Lord of Abydos, heralding the power of Re-Setau, singly himself. I also have the finest frankincense in rock form from Somalia & Dufar. For the most serious to everyday ritual. Every object is also consecrated with the same tears of the gods. 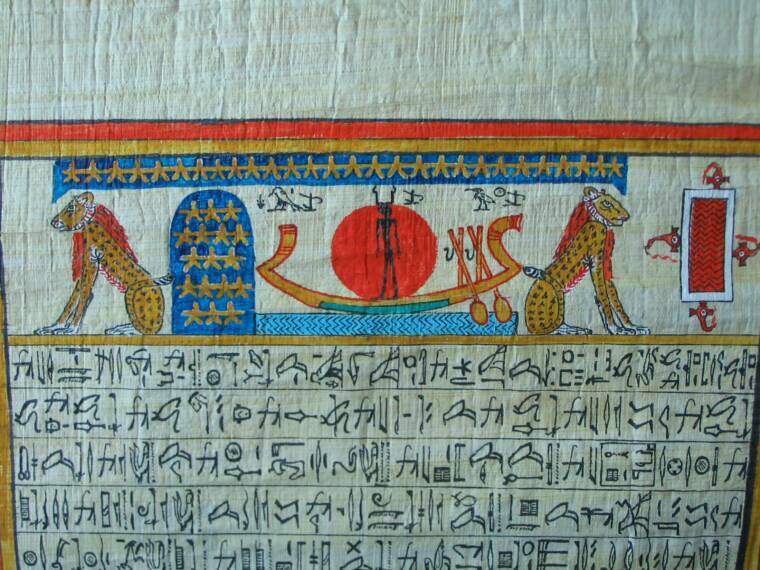 A unique final vignette having the deceased's shadow, ka & akh entering the stars on a solar barque, between the lions of yesterday & tomorrow supporting the sky. Please feel free to leave input & comments in the guest book. They will direct the production of all current & future items. 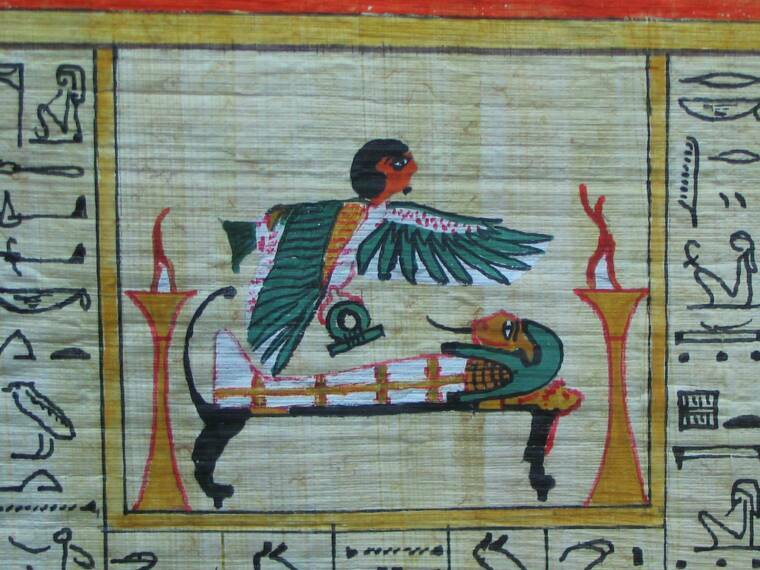 "I am the bennu who is in the land of Iunu"
kissing the earth as the protectress of children before the great god Pre: Oh peaceful one, who returns to peace, grant to me that I may see (what is in) the darkness of your making. 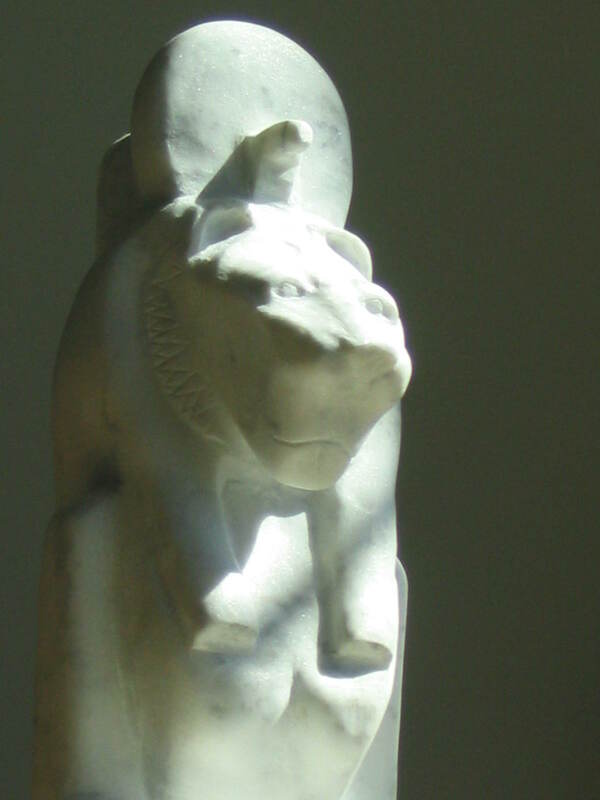 turn to me mistress, at your holy temple in Bubastis, when you are at peace. Grant me a place with your followers and the strong ones who are behind you." These can display the full range of 28 deities or just the labeled divisions for ritual use as a votive to Thoth, the keeper of cosmic knowledge who measured out the heavens & earth. All can be customized with special dedications, double cants, gilding, etc. for a truly unique piece. A sacred device that built the Egyptian empire. Sometimes the need for a scroll is mandatory. Long writings demand a bigger book. 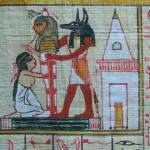 The Tale of the Shipwrecked Sailor was a classic that Egyptian scribes copied for millenia. Here is just a taste of an inspired 4-meter long modern copy with all the flair of an ancient original. 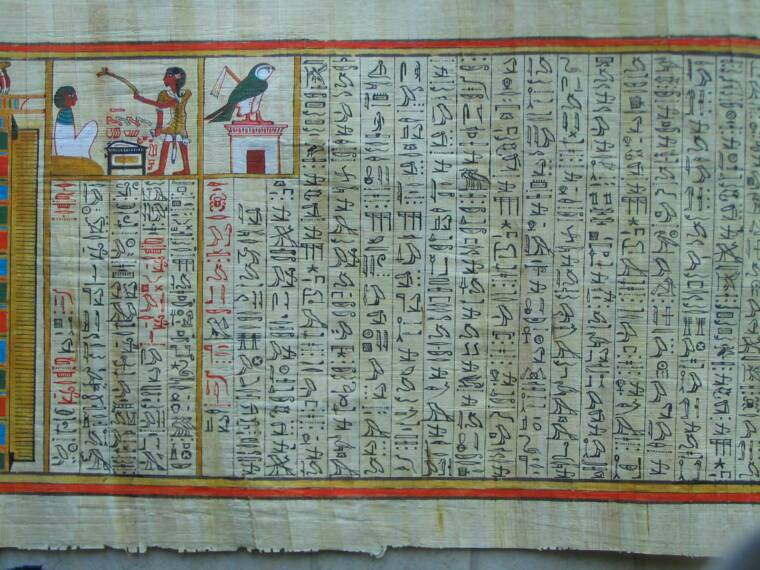 The text comes from the oldest known 4th dynasty tale. 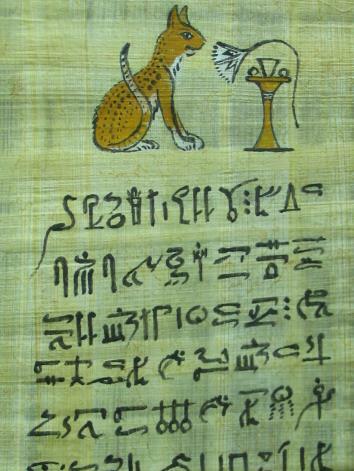 Recreated in Old Kingdom hieratic with rubric. Please email me for additional photos.